F160 is a weighing controller ideal for the use in a limited space such as the inside of a control panel. In addition to a high-accuracy amplifier with extremely low drift installed, various high-specification functions such as high-speed sampling, and the weighing sequence function and control input-output which are convenient for automatic weighing machines, are packed into a compact body. 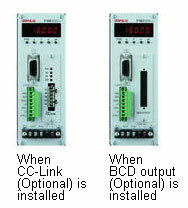 High-speed A/D conversion and powerful digital processing capability of 1000 times/sec..
One option interface can be selected from CC-Link or BCD output. It is of compact design, but a display unit and setting keys are equipped to check indicated values and set the main unit. Feeding and discharging gates can be directly controlled only by giving weighing instructions. Higher-speed weighing and control system line, which is not affected by PLC command timing, can be constructed. – Automatic free fall compensation: Actual free fall fluctuations that are one of the key factors of weighing errors are automatically compensated. – Zero tracking: The slow zero drift and the zero point shift caused by temperature fluctuations are automatically compensated. Bessel low-pass filter to eliminate mechanical vibrations and moving average-type filter to prevent weight value drift are equipped. The attached fittings can be mounted vertically or horizontally. A space-saving, screw-type terminal block is adopted for the loadcell connection section. The terminal block is of the two-piece type that allows its removal from the main unit. Each control output is selectable by setting. Each control input is selectable by setting. This is a simple output serial interface for connection of a UNIPULSE-manufactured printer, external display, etc..
Transmits weight data to a PLC or other BCD devices. Serial bus interface for connection with PLC.